Open Weekend Abel Reel Deal! Fish of the Month February Entry - BlueTrout! Fish of the Month February Entry - First Trout! Fish of the Month February Entry - Big Perch! Fish of the Month February Entry - First Tope! Fish of the Month February Entry - Thai Cat! Fish of the Month February Entry - Margin Carp! Fish of the Month February Entry - Drowes Salmon! GAC March Open Weekend 2012 - Featured Fly Tyers! Fish of the Month February Entry - First Pike! Fish of the Month February Entry - Super Squid! 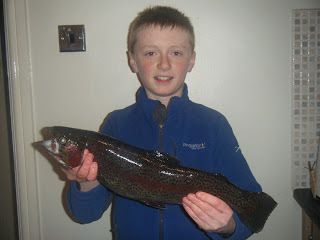 Fish of the Month February Entry - Borland Trout! GAC Open Weekend Event Schedules! Paul Procter Confirms for the March Open Weekend! Klaus Frimor Confirms for the March Open Weekend! Fastnets available now at GAC! Important Message for Auto Lifejacket Owners! Stevie Munn Confirms for the March Open Weekend! New Stillwater Carron Luggage has Arrived! Fish of the Month February Entry - Blue Marlin! Fish of the Month February Entry - Nith Grayling! Fish of the Month February Entry - Arbroath Cod! Aiden Brown caught this 2lb 8oz Rainbow Trout on Powerbait at Borland Trout Fishery. You can vote for this picture to win on Facebook by selecting it in the February 2012 gallery HERE and hitting the 'Like' button!